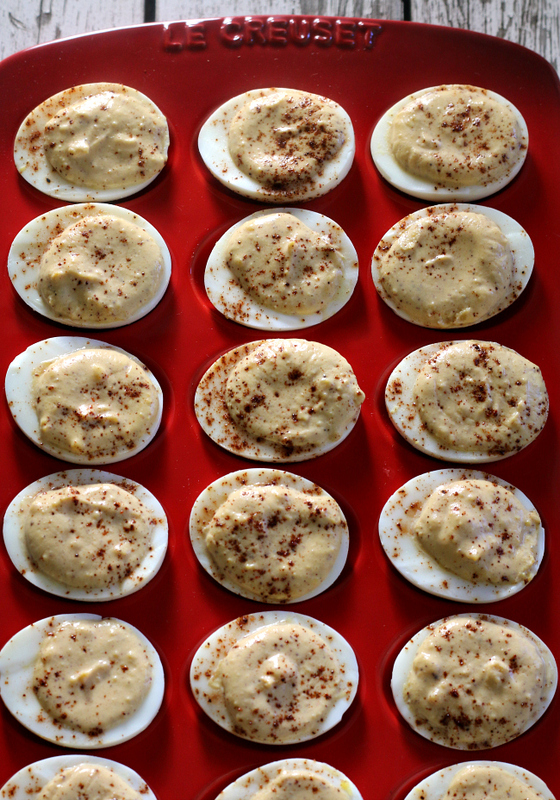 Creamy and tangy, these deviled eggs are a nice change from the usual! Plus, you won’t find any mayo in this recipe! Through my ongoing partnership with Stonyfield, as one of their “Clean Plate Club” bloggers, I get to partner with them on all sorts of fun projects. This month they sent me this beautiful Le Creuset egg platter to feature. This was perfect since I didn’t yet have a deviled egg recipe on my blog. As someone that dislikes mayo, I loved the idea of finding a way to use Greek yogurt in my deviled eggs recipe instead of mayo. I enlisted the help of some friends that make amazing deviled eggs and this recipe was created! The addition of Greek yogurt makes these creamy, smooth and lends a tangy flavor. To best complement the tangy filling, we included spices like chili powder, cumin and cayenne to give a little kick. If you love spicy foods and want to make these spicier, feel free to turn up the heat a little by increasing the amounts called for in the recipe. P.S. I looooove the cherry red color of this Le Creuset stoneware egg platter, but it is available in many beautiful colors here on Amazon if you want to pick one up too! Hope you enjoy these! I think they’ll be a hit at summer parties and potlucks! 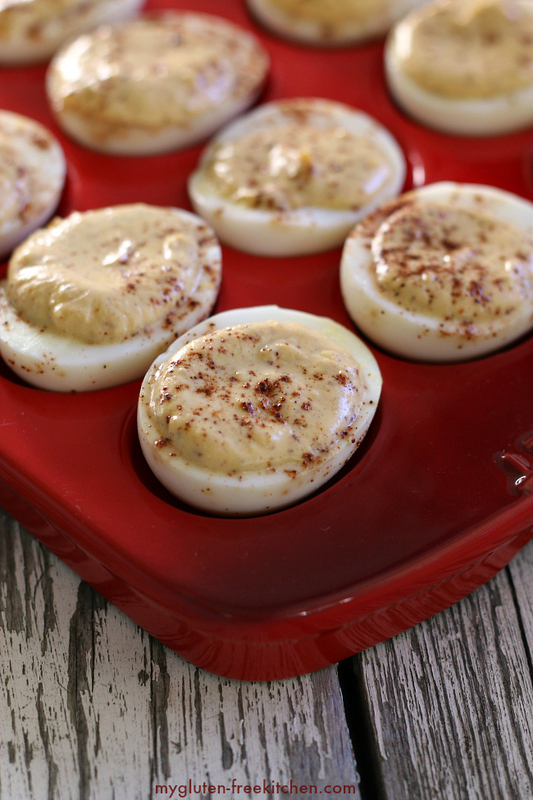 Creamy, tangy and a little spicy, these deviled eggs are a nice change from the usual! Place eggs at the bottom of a pot and fill with cool water until there is about one inch of water above the eggs. Leave the pot over medium heat until the water boils. Once the water is boiling, remove the pot from the heat and allow the eggs to cook for 10 minutes. After the 10 minutes are up, dump out the hot water and put the eggs under running cool water for 3-5 minutes. Once the eggs are cool, they need to be peeled. Gently tap them on the counter, so they'll have a lot of little cracks all over. Then roll the egg between your hands, it'll help loosen the shell. Starting at one end of the egg, slowly peel the shell off under running water. After all the eggs are peeled, cut them in half and remove the yolks from the whites. The yolks come out pretty easy just bending the white a little and pushing it out. As you remove each yolk, set the egg white on your desired serving tray. To have a smoother consistency in the deviled egg filling, it's good to break up the egg yolks with a fork before adding in the rest of the ingredients. Once the yolks are in smaller pieces, mix in the Greek yogurt until it's pretty well blended with the yolks. You can use a fork or low speed mixer for this. Next, add in the chili powder, garlic salt, cumin, and cayenne. Mix until well blended. If you'd like your eggs to be a little more on the spicy side, add in some extra of each of the spices. Once everything is mixed to your taste, begin to scoop out the filling to place into the egg whites. A tablespoon measuring spoon works well for this. After all of the whites are filled, carefully sprinkle a little bit of chili powder over each one. Chill for 1 hour or until set. Enjoy! This sponsored post was created through my partnership with Stonyfield and Le Creuset. As always, all opinions are my own. Collaborating with brands I love allows me to keep bringing you new and varied recipes! Thanks for your support!